Today was officially the last day to drop off #bundleupyeg donations at 102.3 Now! Radio Studios. After hosting a box there for two months, we are beginning to wind down our campaign as we are about to enter our final week of operation. We will continue to collect and deliver clothing donations for local homeless until Dec.24. We are so grateful for all of our supporters and donors, but Now! Radio has a special place in our hearts. 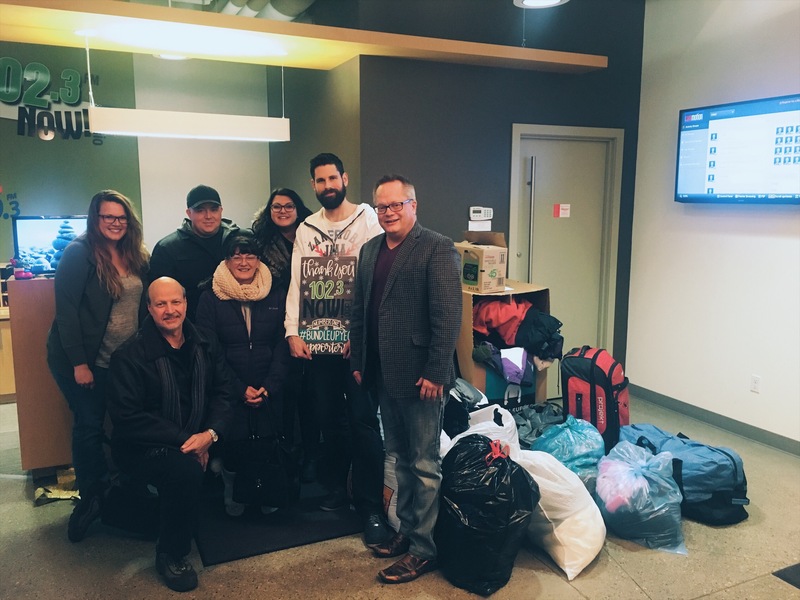 This year alone we collected 224 bags of donations from the #bundleupyeg box at Now! Radio —not only is that more than half of our total donations collected so far this year, but that’s more than our total donations collected during the entire 2015 campaign (170 bags were collected in 2015)! Hundreds of new mitts and socks donated by a nice man named George. There is no doubt in my mind that the success of #bundleupyeg so far is largely due to the amount of incredible support the Now! Radio team has provided to us. Beyond being a drop off location for donations, they supported us online and on-air with consistent shout outs to raise awareness. We are so grateful and thankful to collaborate with this incredible team. Thank you #NOWfamily for opening up your hearts and your closets to keep those in need warm. To show our appreciation, we gifted the Now! team with a number one supporter sign made by the incredible, local Frankie N May. Since Nov.1, we have collected and delivered 401 bags of clothing to shelters. To put this in perspective, between 2013 and 2015, #bundleupyeg collected 370 bags total. This means that in two months alone, we have collected and delivered more donations than all three previous years of #bundleupyeg combined! Thank you to everyone for your support and your donations. They are making a huge impact in our community and we are so proud to help get these clothing items where they are needed most. A #bundleupyeg donation box continues to run at Kingsway Garden Mall in the Holiday Lounge until Dec.24 and at Blitz Conditioning until Dec.19. To keep following our journey before we shut down on Dec.24, connect with us on Twitter and Instagram for a whole ton of updates!